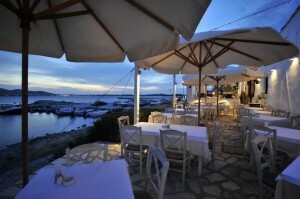 Best Restaurants in Paros island! Since 1998 THEA restaurant on Paros, has been offering to its clients the unique Greek Eastern recipes who came from Constantinopole . The kitchen of viewing the policies delicacies, smells, its spices and our obsession with cooking with more fresh ingredients became faster known special. In this constant search of exquisite perfection learned and marries great food with excellent wine, offering our friends a recognized anymore by all culinary feast. We have 507 tags Greek wines. 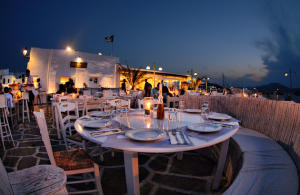 Damianos Tavern is located in Ampelas, a small seaside village on the northern side of Paros, at a distance of 5 km east of Naoussa. The village has a beautiful beach and a quaint fishing port, and this is a perfect place for people who want some peace and solitude. The tavern is quite a sprawling place with both indoor and outdoor dining. The indoor dining area is a charming place with wooden tables covered in white cloth dark wooden chairs and a dark wood decoration, all of which lend a classy timeless appeal very much like the stone manors of the English countryside. An outdoor dining area topped by a trellis ceiling has white-painted tables and chairs for seating and overlooks the small bay where fishing vessels anchor and bring in the catch of the day. The staff of Damianos brings in fresh catch from fishing boats just across the tavern and use it to prepare a variety of seafood dishes based on local recipes. The food is amazingly tasty, sea food in particular and the service is very efficient. The fish is perfectly cooked and it is quite popular with locals and tourists. Some of their signature dishes include gouna (grilled sundried mackerels), Karavalous (snails cooked in a delicious sauce), lobster pasta and fish soup. A well-stocked bar made of wood and stone with a fine selection of wines as well as other international liquor brands fit for the connoisseur are served at Damianos.